Despite that I like having my picture taken, I have always had an uncomfortable relationship with selfies. Even back in 2015 when Sam posted “Sam embraces her title as the selfie queen #feministselfie” I remember my skepticism. I still had that voice in my head that told me it’s just narcissistic, and I have always worried about my own narcissistic streak. Some have gone further, as Erin Gloria Ryan did, claiming that far from being empowering, selfies are a cry for help. She says the women who take selfies and post them on social media are still seeking validation outside of themselves, and for their looks alone. Sam and Alison both think that selfies are especially important for women in mid-life because in presenting ourselves “as we really are” we bash ageist stereotypes. Sam ends her post with a series of sport selfies of herself, defying ageist stereotypes of inactive older women. She looks happy, healthy, and active in all of her shots. Image Description: Tracy (left) and Sam (right) heads together, smiling, window with “Plant Matter Kitchen” in reverse in the background. Image description: Tracy (left) with short hair and in sunglasses, ballcap, and tank top, and Anita (right) with short hair and a red t-shirt, both smiling, green grass and asphalt in the background. Shot taken from above. Okay, so we have that out of the way. I push through my discomfort and take sport selfies. And they do have that effect of offering an empowering self-representation. when I was 48 I couldn’t run around the block. Today, at 53, I have many kilometres under my feet, including a marathon, several half marathons, 10Ks, triathlons up to Olympic distance, and for the most part regular training. I love that about myself and I am even a little taken aback, still today, whenever I see these sporty pictures of myself. And I’m okay with, even enjoy, selfies with others. It’s fun. Life should be fun. Getting together with friends is not just a blast but also, especially my women friends, fills me with a satisfying sense of connection and belonging. I like depicting that. It makes me feel strong and supported when I look at those memories. But lately, I’ve ventured into what feels like slightly different territory. That’s the area of what I’ve been calling “self-portraits.” Now, Sam asked me “what’s the difference between a selfie and a self-portrait?” Well, that’s a good question. My self-portrait phase started when I got my camera. At first I took no pictures of myself with it because, unlike my smart phone, the camera doesn’t have that reverse feature that makes it easy to do. But one day when I took it to my personal training studio, that changed because the studio was full of mirrors. I blogged about personal training and my camera obsession. Image description: head shot of tracy, short blond hair, looking through the viewfinder of a Canon EOS 80D, words reversed because of the mirror image, finger on the shutter release. She explores the difference on several levels, especially the idea of the artist. While I wouldn’t go so far as to consider myself an artist, I do think of my photography as a creative outlet. Those selfies, posted above, aren’t really studies in creativity. I’ve been taking an online photo course through Great Courses, and the instructor, National Geographic photography Joel Sartore, says there are three things to consider when taking a photograph: composition, light, and “is it interesting?” When I take selfies, I don’t think much about any of those. They’re snapshots of life. Empowering in their way. But I do put thought into my self portraits. The mirror in the training studio was a start. When a friend and I did an assignment together over the holidays that involved self-portraits and reflections that looked like candids, that meant I had to consider even more carefully as I was considering my shots. I’ve continued to be attracted to mirrors in a variety of ways. But I also get a kick out of representing self-portraits through shots of only part of me, or of my shadow, and sometimes even with friends in the frame as well. What I find exciting and satisfying about this form of self-representation is that I can capture so much more than a moment, and at least sometimes, I can create something interesting that goes beyond “a picture of Tracy.” Anyway, for now, I’m living with an intuitive distinction between “selfies” and “self-portraits.” And I like them both, even if I am at the moment finding self-portraits to be more satisfying and empowering as a creative outlet. Here are some of what I’ve done recently. Sometimes, I don’t feel it necessary to include much of me. A foot can sometimes be enough and it lets me capture more of the scene, less of myself. A shadow is also fun to play with, particularly when it’s crisp. 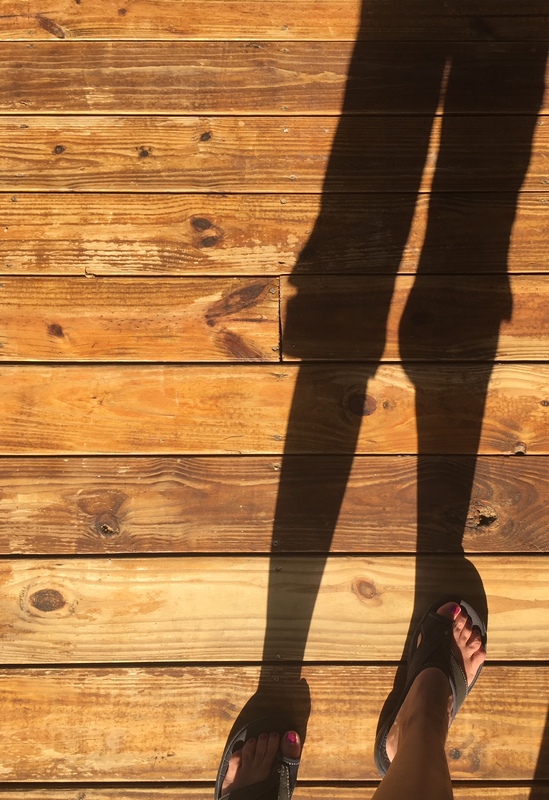 Image description: Tracy’s right foot in a sandal in lower right corner of frame and her shadow from thighs down against a wood plank floor. 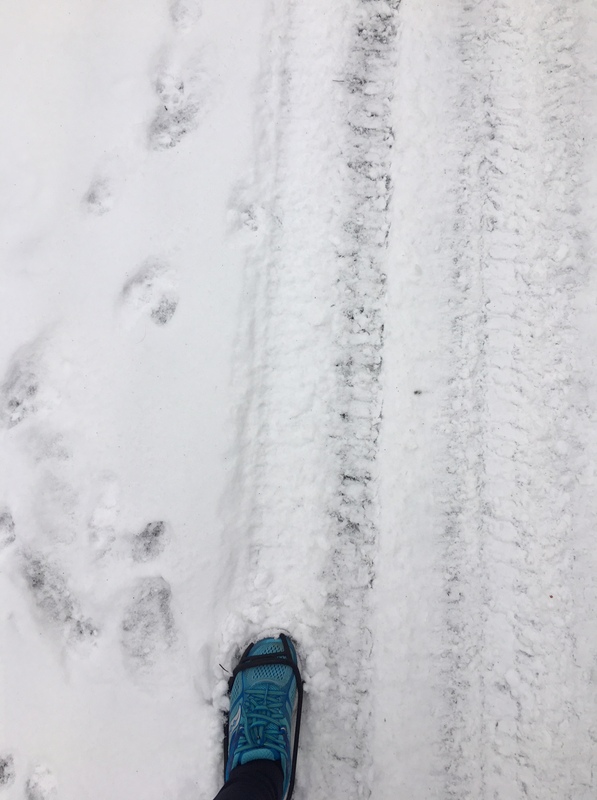 Image description: Tracy’s left foot in running shoe on a snow-covered portion of road with tire tracks and animal tracks. 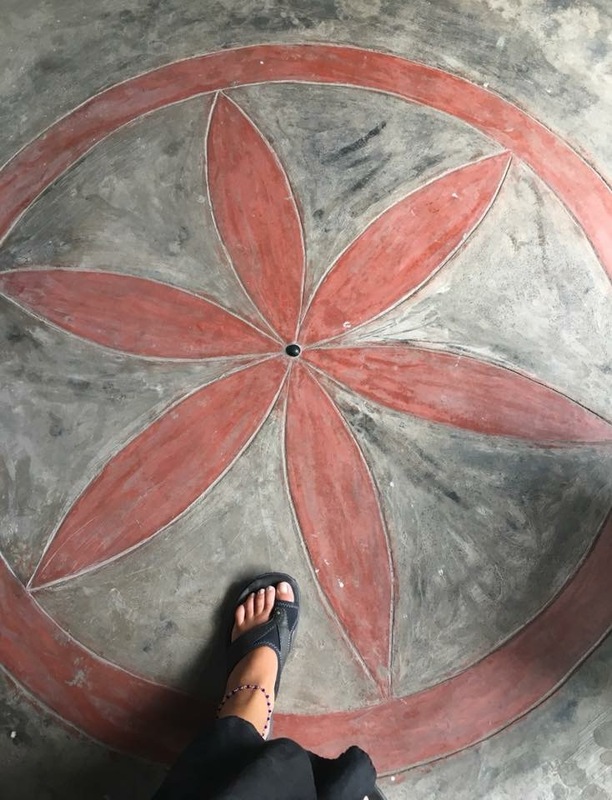 Image description: Tracy’s left foot in a sandal on a floor with a simple painting of a six-petaled red flower in a red circle. Image description: Smart phone shot in Nalli’s sari shop in Chennai, India. Tracy in a long skirt and check top taking a phone pic in the mirror with Nandi on the right (in the mirror) looking at a sari, the mirror frame visible. Image description: Patterned silk scarf in foreground on left and slightly out of focus tattooed forearm wearing a watch on right. Image description: Mirror shot of Tracy from the thighs up, looking through camera viewfinder, wearing a flowing patterned silk scarf, and a sleeveless blouse, a watch on tattooed left arm and silver bracelet on right arm. Plain background. Image description: Tracy, short blond hair, head turned to the side and looking down, arm slung across body to hold up a colourful pashmina, against the background of a colourful framed painting. Image description: close shot of Tracy from mid-neck down to upper chest, wearing an open casual jacket with one button, a silver chain, and a ribbon once around her neck then tied and hanging. All of these pictures make me feel good. Not just because I like the way I look in them, but because at least for me they’re a nice combination of light, composition, and interest. Maybe they’re just selfies on steroids, but whatever they are, they’re giving me pleasure and enabling me to engage in a creative form of empowering self-representation. Do you think there is a difference between selfies and self-portraits? Does it matter? I like this way of drawing the distinction. And I love your photos. It was fun to think about the difference, spurred on (as frequently happens! ❤️❤️☺️) by our conversation. And thank you. I’m getting so much joy from my camera and it’s great that others are enjoying the results as well. Generally speaking I don’t have hardly any selfies on blog. ‘Cause the star of my blog is my opinion, what I see of my world or my worldview. The blog has photos I’ve shot and selected (without my image/selfie) that already defines my perspective of reality. And it’s only part of my perspective. So frequent selfies in a personal but public blog doesn’t add much value to readers. I also put credits for every single posted photo on whether it’s myself or another person (ie. my partner, family member) who took the photo in blog post and what year. So me, me, me is stamped all over my blog without photos of self.